Not only is the Sylvano collection super absorbent, but it is also quick drying, the perfect combination for making this an everyday favorite. The Sylvano is made from 100% Giza combed Egyptian cotton and weighs in at a generous 700 GSM. Oversized and heavyweight, these towels will be durable and long-lasting so you can enjoy them for many years to come. These towels are perfect for completing your perfect spa-like bathroom at home. Cotton will get softer over time. High quality towels will be durable and long-lasting so you can enjoy them for many years to come. These towels are perfect for completing your perfect spa-like bathroom at home. Our 6-Piece Towel set contains 2 bath towels (30" x 56"), 2 hand towels (18" x 30"), and 2 wash cloths (13" x 13"). Each piece is generously sized for its purpose. With 15 colors to choose from, you're guaranteed to find one to your liking. Subdued neutral and cool colors are perfect for matching any decor so you can stock up for every bathroom in the house! Available in Anthracite, Black, Garnet, Dark Anthracite, Dark Chocolate, Eucalyptus, Golden, Indigo, Lavender Frost, Natural, Navy, Prune, Stone, Tile, and White. Machine wash and dry for convenient care, a great every day essential! ABSORBENT: Not only is the Sylvano collection super absorbent, but it is also quick drying, the perfect combination for making this an everyday favorite. The Sylvano is made from 100% Giza combed Egyptian cotton and weighs in at a generous 700 GSM. Oversized and heavyweight, these towels will be durable and long-lasting so you can enjoy them for many years to come. These towels are perfect for completing your perfect spa-like bathroom at home. COMFORT: Cotton will get softer over time. High quality towels will be durable and long-lasting so you can enjoy them for many years to come. These towels are perfect for completing your perfect spa-like bathroom at home. 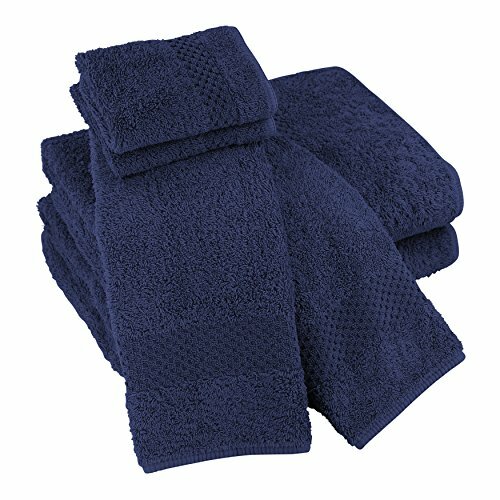 SIZE: Our 6-Piece Towel set contains 2 bath towels (30" x 56"), 2 hand towels (18" x 30"), and 2 wash cloths (13" x 13"). Each piece is generously sized for its purpose. SELECTION: With 15 colors to choose from, you're guaranteed to find one to your liking. Subdued neutral and cool colors are perfect for matching any decor so you can stock up for every bathroom in the house! Available in Anthracite, Black, Garnet, Dark Anthracite, Dark Chocolate, Eucalyptus, Golden, Indigo, Lavender Frost, Natural, Navy, Prune, Stone, Tile, and White. EASY CARE: Machine wash and dry for convenient care, a great every day essential!